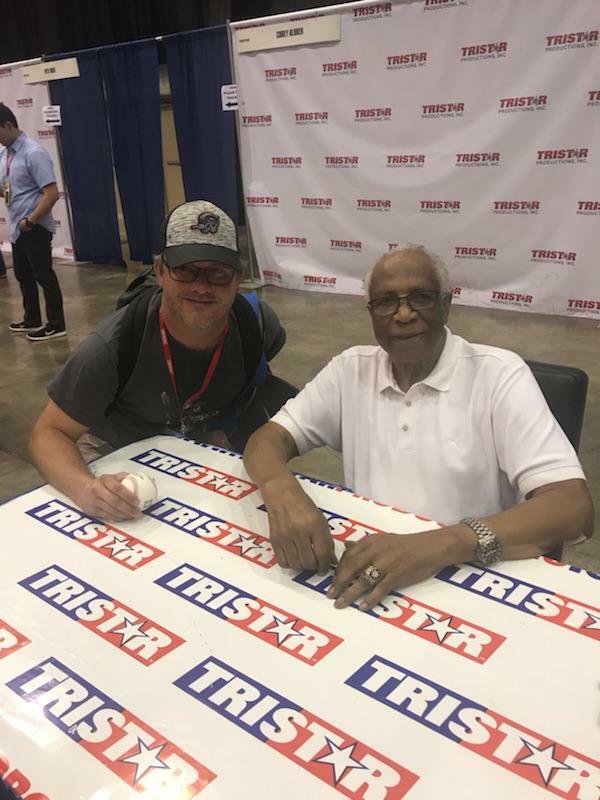 I received the text message from my friend Michael that Frank Robinson had passed away right as I was getting on a conference call for work. I didn't have much time to process the information while I was discussing work stuff, but it still hit me pretty hard. I knew Frank wasn't doing well, but conflicting reports a few days ago at least gave me some optimism that he was better off than what I had initially feared. Sadly, he succumbed to bone cancer today at the age of 83. Frank was the last of the Orioles Hall of Famers that I hadn't "met". I use quotations there, because I still count being shoulder bumped by Earl Weaver meeting him. I was lucky enough that my good friend, Ryan, was working on an Orioles Hall of Fame project, and needed Frank on a baseball. He paid for me to go to the signing at this past year's National, and I would be able to meet Frank in exchange for getting Ryan's ball signed. I'm so glad I was able to take advantage of that opportunity. For whatever reason, Frank is such an underappreciated baseball legend. 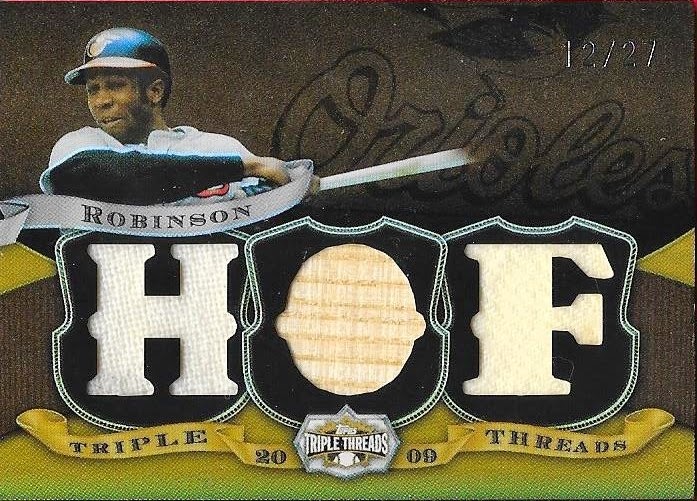 His 586 home runs were 4th all-time when he was inducted into the Hall of Fame in 1982 (alongside his good friend, Hank Aaron), and continue to be ranked 10th all-time. He was a World Series winner in 1966 and 1970 with the Orioles. He is the only player to win the MVP Award in both the AL and NL. He was the Triple Crown winner in 1966. He is part of one of the worst trades in MLB history, and he also turned the Orioles organization into a perennial contender. He was the first African American manager in MLB. Yet, when legends of baseball are discussed, Frank's name hardly ever comes up. I'm not sure why, but that needs to change. His number 20 is retired by the Orioles, and he has a statue in Camden Yards (and also in Cincinnati). He was the 81st Hall of Famer on a baseball in my collection, thanks to my good friend, Drew. This is the image I always want to remember Frank by. 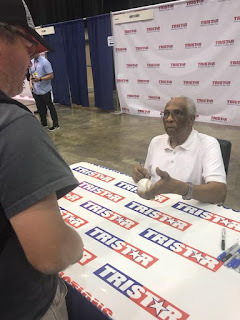 Here he is at the 2018 National after having signed Ryan's baseball. The autograph vouchers never come with photo-ops; you have to pay for those separately. Still, I figured it wouldn't hurt to ask, right? Well, the look Frank is giving me is right after I asked if he would pose for a photo. A stone cold gaze, and then he dropped Ryan's ball on the table. I was about to apologize profusely, when Frank grinned, and said "sure, come on." The photo at the top of this post is the result. He even shook my hand after and smiled. I read later on that Frank had a sharp and biting sense of humor, and it was on full display here. Furthermore, while I was waiting to have the ball signed, I saw Frank's wife sitting next to him looking bored. All of the fans would greet Frank, tell him how great he was, how they were big fans, but no one would speak to her. So, I said hello to her and asked her if she was having a good day. It looked like it took her by surprise, but she thanked me for asking her. She asked me my name, where I was from. She told me her name, and what she did. That she was enjoying the show. She was such a super nice lady. I can't help but think of her, and hope that she can find comfort and peace in this difficult time. Her husband is no longer suffering from the bone cancer that took him so quickly. He is definitely loved, and will be missed by the countless fans he won over the years. I'm so happy that I got the opportunity to meet him (and her), and I will always remember him fondly. Rest in peace, Frank, you truly are one of the all-time greats. Thanks Ryan for buying the voucher that allowed me to meet him, and thanks Michael for the great photos.